Reasons Social Security Disability Applications Are Denied | Johnson & Gilbert, P. A. When you're no longer able to work because of a medical condition, you may be entitled to Social Security Disability payments. However, you can't assume your application will automatically be granted. In fact, many are denied. It's important to understand the reasons for this to ensure that you protect your legal rights. Lack of medical evidence. In order to receive Social Security Disability benefits, you must prove your disabling medical condition prevents you from working. You need strong medical evidence to establish this, and your claim could be denied if your doctor doesn't provide the documentation you need. Previous denials. Some people just file a new application if their initial one was denied. However, this could result in an automatic denial. A better approach may be to appeal the denial of your initial application. Length of disability. If your disability won't last for at least 12 months, or isn't expected to lead your death, you don't qualify for Social Security Disability payments. Lack of cooperation. You're required to cooperate with the SSA while your application is being decided. If you don't provide them with requested documents, or fail to attend medical exams, your claim will most likely be denied. Failure to follow treatment plan. If you fail to follow the treatment plan prescribed by your doctor, the claims adjuster won't be able to determine whether your condition prevents you from returning to work and will deny your claim for benefits. Failure to provide contact info. The SSA must have your current address to send communications regarding required medical exams, documents you need to submit, and other matters. When representatives are unable to reach you, they may deny your claim. 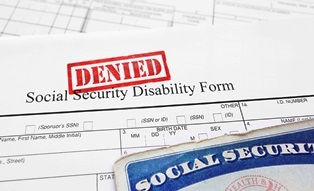 Was your Social Security Disability application denied? This doesn't mean there were legitimate grounds for the denial—in fact, you could still qualify for benefits. If you live in the Daytona Beach area, our experienced Social Security attorneys can help appeal your denial. Call our office today to schedule a free consultation to learn more about your right to benefits.